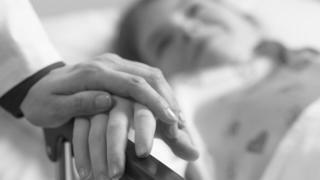 There has been a 40% increase in people being fast-tracked for cancer treatment in Wales over the past five years. Latest Welsh NHS performance data showed 7,573 patients diagnosed through the "urgent suspected cancer route" began treatment in the last year compared to 2,286 patients in 2012. The Welsh Government said it was down to earlier detection and referrals. But the Macmillan Cancer Support charity was critical that some treatment time targets were missed. The stats showed there was a 6% increase, 432 patients, in the last year. The Welsh Government has a 95% target to treat patients who have been diagnosed with cancer through the urgent route within 62 days. That was missed in August 2017, when 87.4% of patients were seen in that time frame. It did meet the 98% target to start treating patients within 31 days of being diagnosed through other non-urgent referral routes. The Welsh Government said the rise in cases being referred can be explained by a number of factors, including GPs recognising and diagnosing cancer earlier. Recent years have seen a significant focus on the detection for cancer following the introduction of new referral guidance from the National Institute for Health and Care Excellence (NICE) and the Cancer Delivery Plan for Wales. A Welsh Government spokesman said: "The increase can also be attributed to the impact of an increasing and ageing population, as well as the impact of historic lifestyle factors and improved referral practices for suspected cancer." He said they were also working hard to raise awareness of the symptoms of cancer and were providing better access to diagnostic testing. "Cancer survival rates continue to improve in Wales and despite the increase in the numbers being treated, the percentage seen within target time has also improved as well," the spokesman added. Susan Morris, head of services for Macmillan Cancer Support in Wales, said: "The latest cancer treatment waiting times in Wales show that while the 31 day target was met, the 62 day target for urgent cases was missed again. "More than 19,000 people are diagnosed with cancer in Wales every year and Macmillan wants every person to be diagnosed early, given high quality timely treatment and to have the right support to live as well as they can with cancer". Andy Glyde, Cancer Research UK's public affairs manager in Wales, added: "What's important is that the NHS in Wales is ready and able to diagnose and treat more people in future so they have the best chance of surviving their diagnosis. "This means continuing early diagnosis initiatives and importantly enough staff and kit so that more cancer tests can be done on time."